There are reports of partially blocked and slow traffic due to a collision involving two cars on the B2098 Sutherland Avenue both ways at Collington Lane East, near Bexhill. On the A27 the road is partially blocked with queueing traffic due to a stalled truck westbound from the A26 (Southerham Roundabout) to A275 Brighton Road (Ashcombe Roundabout). 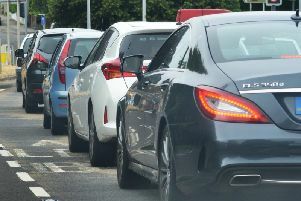 On the A259 there is queueing traffic on the A259 Bognor Road Westbound from B2144 Drayton Lane to A27 Chichester Bypass (Bognor Bridge Roundabout), which is affecting traffic heading into Chichester. There is queueing traffic on the B2259 Chichester Road at Chalcraft Lane in the construction area, with temporary traffic lights in operation. Elsewhere on the A27 there is queueing traffic on Lewes Road westbound from Brown Jack Avenue to Alfriston Road (Drusilla’s Roundabout). And on the A24 there is queueing traffic on the Great Daux Roundabout northbound from A281 (Broadbridge Heath Roundabout) to A264 (Great Daux Roundabout). East of the county there is congestion on the A22 Boship Roundabout northbound at A267 (Boship Roundabout). And elsewhere on the A27 there is queueing traffic eastbound from A2038 Devil’s Dyke Road to A23 London Road (Patcham).